The symptoms of allergic contact dermatitis are very similar to the ones caused by irritant contact dermatitis, which makes the first even harder to diagnose. The first sign of allergic contact dermatitis is the presence of the rash or skin lesion at the site of exposure. Depending on the type of allergen causing it, the rash can ooze, drain or crust and it can become raw, scaled or thickened. Also, it is possible that the skin lesion does not take the form of a rash but it may include papules, blisters, vesicles or even a simple red area. The main difference between the rash caused by allergic contact dermatitis and the one caused by irritant contact dermatitis is that the first one tends to be confined to the area where the trigger touched the skin, whereas in the second case, the rash is more likely to be more widespread on the skin. 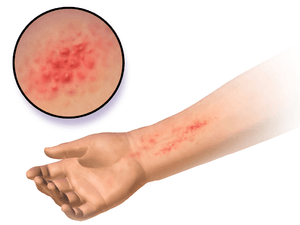 Another characteristic of the allergic contact dermatitis rash is that it usually appears after a day or two after exposure to the allergen, unlike irritant contact dermatitis that appears immediately after the contact with the trigger. Nickel (nickel sulfate hexahydrate) – has been recognized as a significant cause of allergy. This metal is frequently encountered in jewelry and clasps or buttons on clothing. Current estimates gauge are that roughly 2.5 million US adults and 250,000 children suffer from nickel allergy, which costs an estimated $5.7 billion per year for treatment of symptoms. A significant portion of nickel allergy is preventable. Oily coating from plants of Toxicodendron genus – poison ivy, poison oak, and poison sumac. ↑ Kimber I, Basketter DA, Gerberick GF, Dearman RJ (2002). "Allergic contact dermatitis". Int. Immunopharmacol. 2 (2–3): 201–11. doi:10.1016/S1567-5769(01)00173-4. PMID 11811925. 1 2 3 4 "Contact dermatitis". Archived from the original on 15 June 2010. Retrieved 2010-06-16. ↑ "Contact Dermatitis Symptoms". Retrieved 2010-06-16. ↑ "Allergic Contact Dermatitis". Archived from the original on 28 June 2010. Retrieved 2010-06-16. 1 2 "Balsam of Peru contact allergy". Dermnetnz.org. December 28, 2013. Retrieved March 5, 2014. ↑ (Kimble et al. 2002). ↑ White SI, Friedmann PS, Moss C, Simpson JM (1986). "The effect of altering area of application and dose per unit area on sensitization by DNCB". Br. J. Dermatol. 115 (6): 663–8. doi:10.1111/j.1365-2133.1986.tb06646.x. PMID 3801307. ↑ Iwasaki A (2009). "Local advantage: skin DCs prime, skin memory T cells protect". Nature Immunololgy. 10 (5): 451–453. doi:10.1038/ni0509-451. PMC 3662044 . PMID 19381136. ↑ "Contact dermatitis". Archived from the original on 19 June 2010. Retrieved 2010-06-16. ↑ "Tests and diagnosis". Archived from the original on 19 June 2010. Retrieved 2010-06-16. ↑ "Self-Care at Home". Archived from the original on 15 June 2010. Retrieved 2010-06-16.